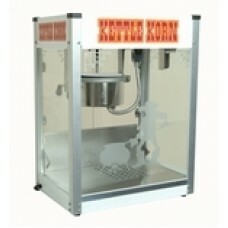 Specially designed for sweet "kettle korn", easy-to-clean kettle, rapid-heating high-output kettle, simple controls for convenient operation, warming deck and kernal catcher. 6 oz. Pops 113 one-ounce servings per hour. A great counter-top model. Dimensions: 20"W x 26"H x 14"D.